One of the typical Mumbaiya dish, Pavbahji is ill-famous as the buttery medley of vegetables, tomatoes and spices, mashed till gooey, and served with crunchy onions and lemon wedges, accompanied with butter slathered, spiced up laadi pao, a match made in heaven ! Many complain that no matter what recipe they follow, home made pavbhaji do not taste like that of restaurant. Well, the culprit IMHO is butter. 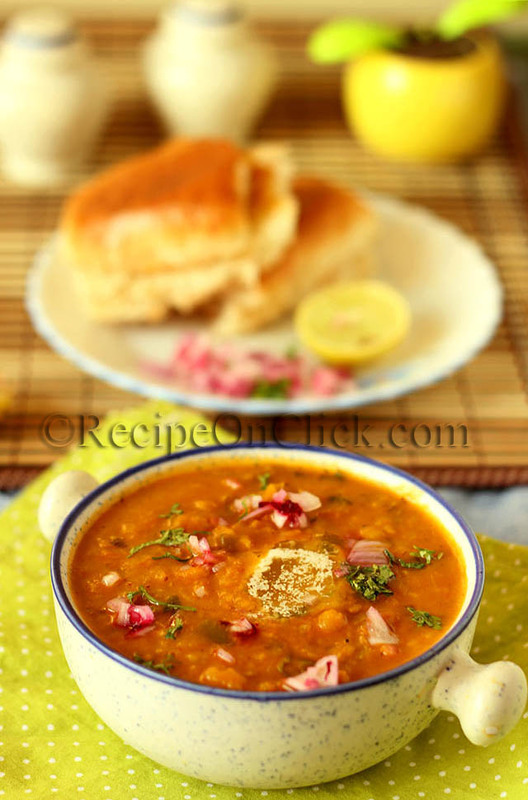 We just can’t convince ourselves to add the substantial amount of butter in Pavbhaji while cooking it at home. I have experimented with many recipes of pavbhaji but so far, this recipe tastes very close to the restaurant style, sans the extensive amount of butter or any artificial color or loads of red chilli powder. 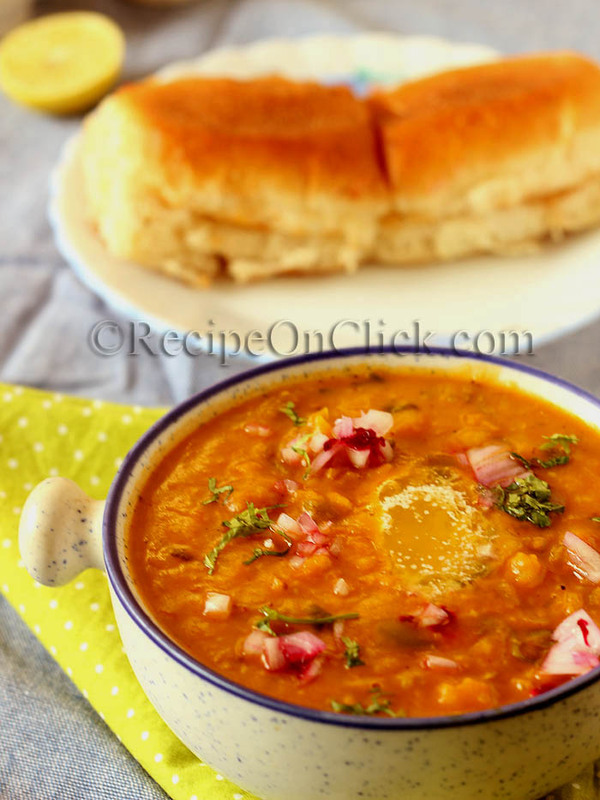 Do try and let me know your take on this particular Pavbhaji recipe ! Boil potatoes (in jackets) till almost done. Cool, peel and break into chunks. Soak cauliflower florets in hot salted water for 20 minutes to kill small germs if any. Slit tomatoes at the top making a cross. Blanch in hot water for 2 minutes or so and immediately transfer tomatoes in cold water. After sometime, either mash them using pavbhaji masher or blend to make the purée. Pressure cook cabbage, peas and soaked cauliflower using little water (Two whistles of cooker). Strain and reserve the liquid if any. 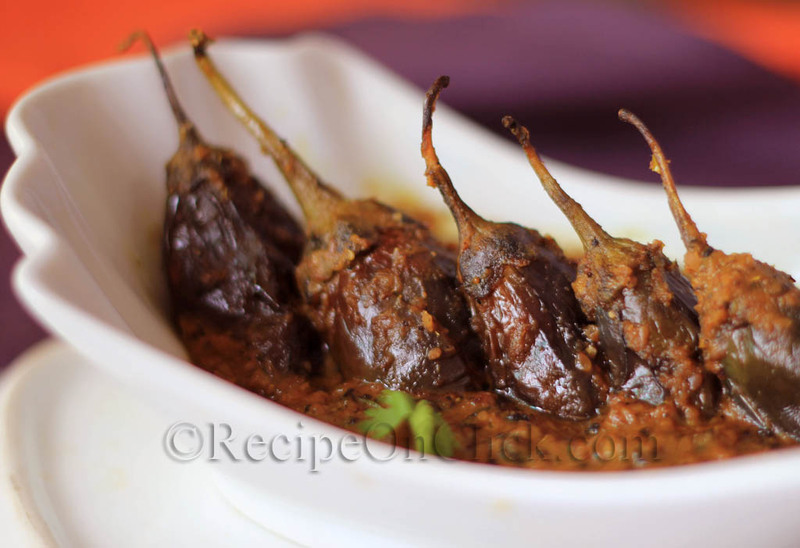 In a large pan or kadhai , pour 1 tbsp of oil and sauté chopped onions, till translucent. Add chopped capsicum and cook on high flame, tossing frequently. Add ginger garlic paste and cook till onion turn brown. Add mashed or pureed tomatoes, boiled potatoes, vegetables and mash a little, using Pavbhaji masher. Add salt, pavbhaji masala, garam masala powder, green chillies, red chilli powder and keep mashing till a mushy mass is obtained. Add around 1 tbsp of butter and some fresh, chopped coriander leaves and keep mashing. Add around half cup of water or reserved liquid and lower the flame. 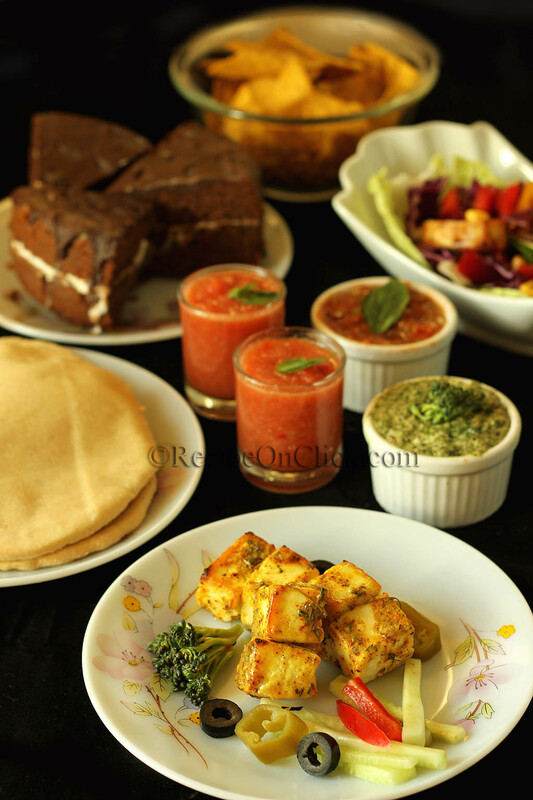 Cook till the flavors blend well and adjust the seasoning as per your taste. While serving, garnish bhaji with chopped onions, butter, coriander leaves, and lemon juice. Heat a griddle , lower the flame to minimum and put some butter on griddle. Immediately add some chopped onions, coriander leaves (finely chopped) and a sprinkle of pavbhaji masala. Cut open the pav, in a way that its connected at one end, place it on the butter and masala mixture with the spongy side facing the masala. Move the pav on the griddle so as to coat it well with the butter masala mix and leave for few seconds. Pour some more butter and cook on other side. Serve the masala coated pav with the bhaji and relish it piping hot. 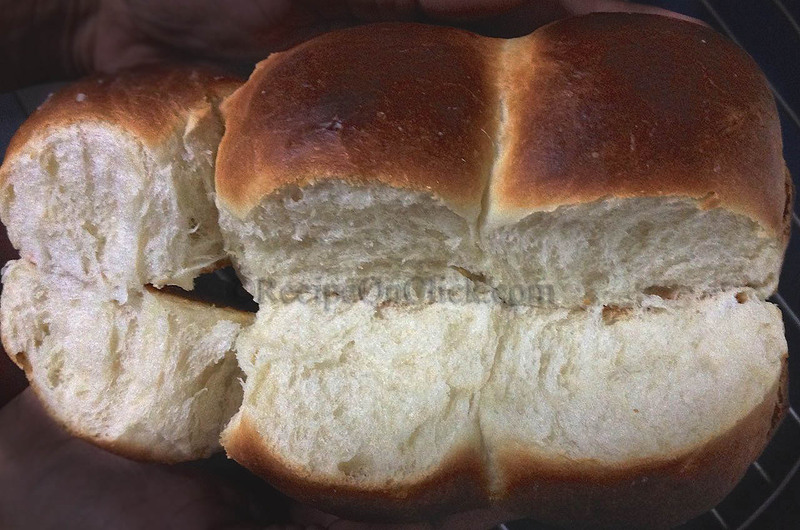 Want to bake, bakery- like soft, pillowy laadi pav at home? 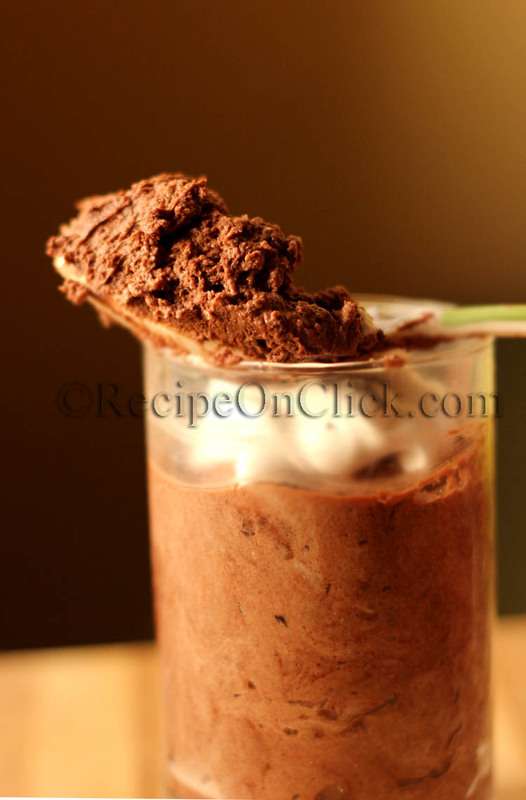 Then click here to know the detailed recipe !